Brandon Spikes lost snaps to Dont'a Hightower last week and his owners paid for it with a 1-0-0 snap line. The matchup against the 49ers is a good one this week, but I wouldn't trust him as anything more than an LB4 moving forward. Tyvon Branch has been listed as OUT on a few league management websites (e.g. Yahoo! ), however I can't find any information directly from the team that confirm these reports. He did miss practice on Wednesday and I would definitely have a plan B in place as it looks like he won't play this week. Corey Graham has been solid the last few weeks, but Jimmy Smith looks like he may return which means Graham would be pushed out of the starting lineup and lose a good amount of snaps. Make sure to watch the injury report to see of Smith is going to start, if so, I would look elsewhere for a CB play. Even with Wes Woodyard out of the lineup last week, D.J. Williams remained in a part time role and continued to rotate with Danny Trevathan. Woodyard looks like a good bet to return to the starting lineup this week. Clay Matthews appears to be on track for a return to the starting lineup as well in Week 15. Charles Woodson has been ruled out for Sunday and will have his eye on Week 16 for his return to action. LDT Lamarr Houston (OAK) - Houston has been fairly solid in the tackle department this season and has had a sack in two straight games. He has a good matchup this week against the Kansas City Chiefs where he should be able to register 3-4 solos and have a good shot at a sack. DT2+/DL3-. LDE Corey Luiget (SD) - Liuget has had a sack in three straight games and has an above average matchup against the Panthers this week. He's been receiving a lot of snaps and should have a good day for owners in Week 15. Consider him a DL3-/DL4+ pickup. LDT Nick Fairley (DET) - Fairley has scored double digit points in 4 of the last 5 weeks and has a juicy matchup against the Cardinals this week. He's a great start in DT-required leagues and should be a serviceable DL3 play in moderate to deeper IDP leagues. RDE Frostee Rucker (CLE) - Rucker's been decent this year and is coming off his best game of the season in which he registered 7 total tackles and a sack. He has a top level matchup against the Redskins this week and should serve as a decent DL3- play this week for those in a bind. LILB Ray Lewis (BAL) - Lewis has a good chance to play this week. And if he plays, he's likely to play enough snaps to be a viable fantasy LB2- or higher seeing as the Ravens are very thin at ILB with both Dannell Ellerbe and Jamaal McClain banged up. He's worth rostering, if not for this week, then for next week (championship week in most leagues). MLB Nick Roach (CHI) - Roach started in place of Brian Urlacher last week and played every down. Expect him to retain that every down role this week against the Packers. Although Green Bay hasn't been a very good matchups for LBs this year, Roach could help owners that are in a pinch for an LB4. SLB Phillip Wheeler (OAK) - After a hot start, Wheeler has cooled off a bit in recent weeks. However, the matchup against the Chiefs this week should help him come out of his slump. They are 4th in the league in rushing attempts, 6th in the league in tackle opportunity allowed, and give up the 4th most points to opposing linebackers. I expect Miles Burris to have a solid game as well this week. WILB Brad Jones (GB) - Jones has had 6 or more solos in five out of the last six games and faces off against the Bears who are currently allowing the most points to opposing fantasy linebackers. 8-10 total tackles is a reasonable expectation from him this week. LILB Larry Foote (PIT) - Foote has been solid with over 90 total tackles and 4 sacks so far this season but has managed to fly under the radar in most leagues. The Cowboys are a mediocre matchup for linebackers, but they are quite susceptible to inside pass pressure. Foote rushes the passer an above average amount of times for a ILB and has a good chance for a sack and 4-6 solos. LCB Cassius Vaughan (IND) - Vaughn has been slotted into an every down cornerback role for the Colts due to a season-ending injury to Jerraud Powers several weeks back. He's had back-to-back games with 8 solo tackles and has struggled a bit in pass coverage. With this said, expect teams to continue to throw at him. He should be a viable start in CB-required leagues this week against the Texans. SS Stevie Brown (NYG) - Brown has been on an absolute tear while filling in for the injured Kenny Phillips. He's had 7 INTs over his last 11 games. And has had 5 games with 6 or more solos during that time frame. If you are looking for a high risk/high reward DB this week, Brown is one of your best options. 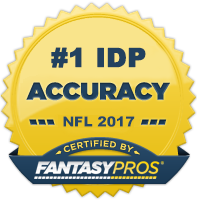 FS Isa Abdul-Quddus (NO) - Quddus came in for the injured Malcolm Jenkins last week and posted 5 total tackles and an INT. He's likely available in nearly every IDP league and should make for a decent DB3-/DB4+ desperation play against the Bucs this week. RCB E.J. Biggers (TB) - Biggers has registered 18 total tackles and an INT over his last three games and should be able to build upon those numbers quite well with Drew Brees and the Saints on the schedule for the Bucs this week. Per usual, the Saints are gonna throw the ball a ton and that should translate into good tackle opportunity for the 4th your corner out of Western Michigan.